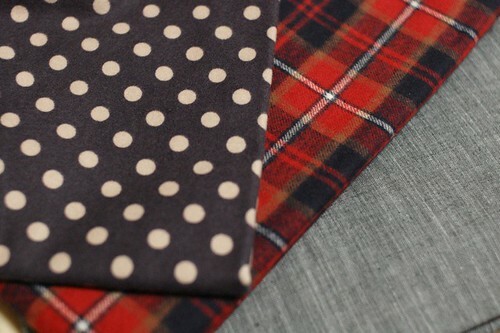 Today I got some linen fabrics and cotton / wool fabrics. 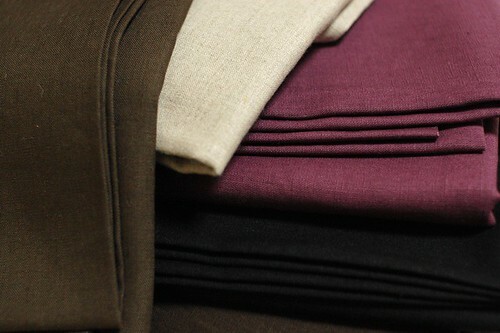 I like the purple linen and am thinking of what I make with it. The color is very clear and beautiful. I'd like to make some bags or pouches with them. Before I got them, I made these bias tapes. I have too much fabric stash now, so I made them. It's fun to think of the combination of the fabrics. 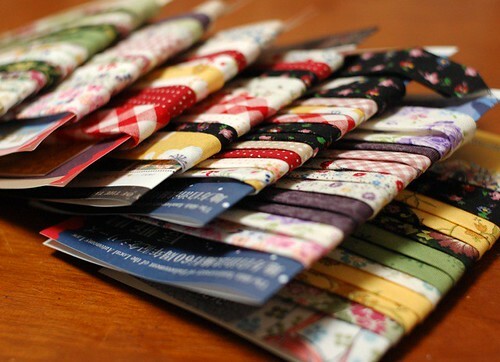 I opened stash boxes one by one, and enjoyed picking up fabrics. They are key chains what I made several days before. I used my favorite linen and cotton fabrics. And also, I put my leather scraps to put the chains. Their backs are of my favorite cotton. I hand embroidered their faces with Sashiko thread. It's good on the linen. I'm still sleepy after my jogging/walking. But I'm enjoying both jogging and hand sewing every day. Almost every morning I meet Bo-chan and he is doing well. But he still eats ice cubes, and it makes me worried. But when I asked his owners about it, they told me that he doesn't drink water at all and only eats ice. If it snows, he would eat it... ??? i like your blog lots!!! really cute key chains *_* every post of you give me inspiration ^^. Thank you and have a merry christmas! how funny! bo-chan must like the crunch of the ice instead of getting his mouth wet by drinking water. that is quite strange though for a dog. 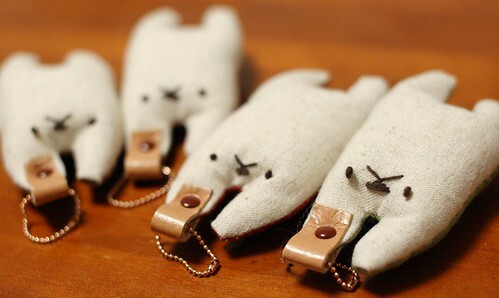 i really like the new keychains you've made, the faces are too cute. Ces petits porte-clés sont très mignons. hola, que creaciones más bellas, se ven muy tiernas y con una delizadeza unica en la manera en que las realizastes.... admito tu talento. Hi Mai! I love to sew with linen - I've collected lots from Op shops and garage sales and find that the old, used, well-washed linen is so soft and manageable. Magic material. 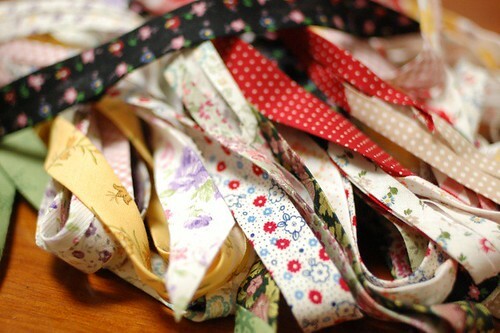 Enjoy your new fabrics, but try some old, vintage pieces too. As usual, i really enjoy your blog ! Oh! Mai, they are just way too cute. Good work. 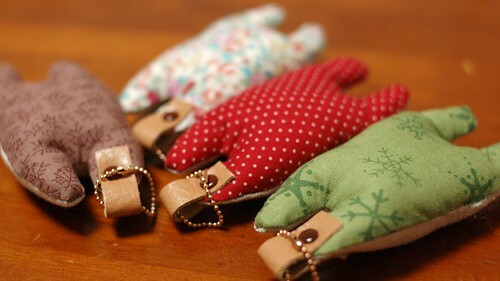 Lovely whimsical keychains! It's nice that Bo-chan has good friends like you. I wouldn't be too worried about Bo-chan. I ask a friend who takes care of lots of dogs, and eating ice isn't unusual. ti ammiro.ogni cosa che crei è bella.ogni oggetto ha stile.ogni oggetto porta con se una poesia.fose è il fasciono orientale,forse invece sei proprio tu.ad ogni modo mi ricarica passare a vedere cosa fai. Dear Mai, i adore the bias tapes you made and those keychains are soo cute! Merry Christmas! I hope it was bright and merry for you and yours. Love to you! Hi, I'm new on you blog. I realy don't know how I came here but I know i realy love your work, it's great. I'll be following you from now on! I wish you a happy and creative new year! Renata. oh these little key chains are sweet and the fabrics delicious. i love this!! very kawaii!!!! When people eat or chew ice, it usually means they're anemic. You should take your dog to the vet and get him checked out. 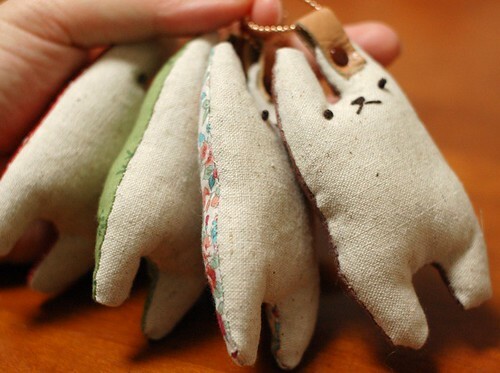 I loveeeee your bunny keychains! Reading your blog has made me want to learn how to sew. If its not too difficult, can you share the pattern for the bunnies? Thank you! Congrats on your marriage and baby! Hi Mai, I'm Ru Hui form Malaysia. I just adore your website! I made a rabbit pencil box chain based on your rabbit keychains. They're absolutely adorable! Thx Mai!